Released in September 2014 by Select Button Inc. Survive! Mola Mola is a pet simulator that can be downloaded for free on Android and iOS. The objective of the game is as you may have guessed from the title "Survive! Mola Mola",which is to survive and making your mola mola the biggest fish in the ocean. 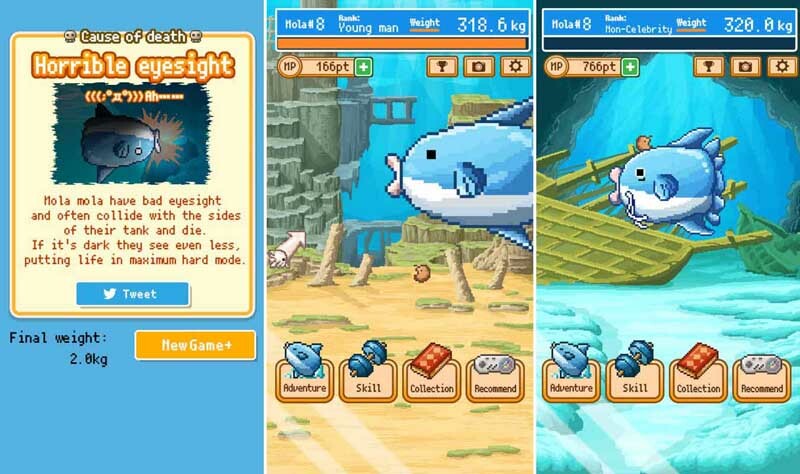 The catch is, though, is your Mola Mola is one extremely fragile creature. You don't really do much aside from feeding him and sending him off to random adventures. However, each of the things you make him do may kill him. Even the food he eats may kill him randomly. It's a good thing though that evolution helps you in a way of giving him increased resistance to dying from that particular thing that killed him.